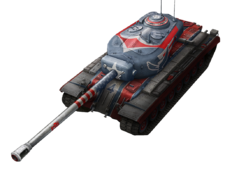 The T34 Independence performs exactly like the normal T34. The T34 prototypes were similar in appearance to the T29 and T30 tanks, except for the longer barrel of the 120mm gun. Like the T29, the combination gun mount was fitted with two coaxial .50 caliber machine guns on the left side of the cannon. The heavier weight of the 120mm gun required the welding of an additional four inches of armor onto the rear of the turret bustle to balance the long cannon. On the pilot tanks, this provided an obvious identification point. No doubt, if the tank had gone into production, the rear of the turret casting would have been thickened up and it would not have been so easily detected. Like the 120mm antiaircraft gun from which it was developed, the T53 cannon used separated ammunition. Thus, the ammunition stowage in the T34 was similar to that in the T29 and T30 tanks, which used the same type of round. The 120mm projectile and cartridge case each weighed about 50 pounds, so the problem of the two loaders in handling the ammunition was not as severe as with the 155mm gun in the T30. However, another problem arose during test firing at Aberdeen and Fort Knox: tests revealed that dangerous concentrations of smoke and carbon monoxide formed inside the turret after firing a few rounds. Also, flarebacks hospitalized at least two men at Fort Knox, and singed the hair and eyebrows of several others there and at Aberdeen. These flarebacks were caused by unburned powder gasses in the gun tube being sucked back into the turret by the pumping action of the ejected cartridge case. A flash resulted when these hot gasses mixed with the oxygen in the turret. To prevent the flarebacks, a bore scavenging system was developed using compressed air to sweep out the gun tube before the breech opened. However, this complex arrangement resulted in leaks at the various valves, and required space for an air compressor and reservoir. A simple solution to the problem was the installation of an aspirator-type bore evacuator. Previously tested on the 90mm T15E4 and M3E4 cannons, it consisted of a cylindrical chamber fitted around the gun barrel just behind the muzzle. Holes angled towards the muzzle were drilled along the barrel wall and connected the bore with the evacuator chamber. As the projectile moved down the tube past these evacuator ports, the high gas pressure in the bore also pressurized the evacuator chamber. Once the projectile cleared the muzzle, the pressure in the bore dropped rapidly and the high pressure remaining in the evacuator chamber caused the formation of high-velocity gas to jets from the evacuator ports. These jets angled toward the muzzle, sweeping the powder gas out of the bore before the breech opened. Tests at Aberdeen and Fort Knox showed that this simple device was extremely effective and it became a standard feature of new tank guns. This page was last modified on 15 May 2017, at 17:18.